Study Design: A randomized, double-blind, controlled trial. Objective: To determine the clinical effectiveness of therapeutic lumbar facet joint nerve blocks with or without steroids in managing chronic low back pain of facet joint origin. Summary of Background Data: Lumbar facet joints have been shown as the source of chronic pain in 21% to 41% of low back patients with an average prevalence of 31% utilizing controlled comparative local anesthetic blocks. Intraarticular injections, medial branch blocks, and radiofrequency neurotomy of lumbar facet joint nerves have been described in the alleviation of chronic low back pain of facet joint origin. Methods: The study included 120 patients with 60 patients in each group with local anesthetic alone or local anesthetic and steroids. The inclusion criteria was based upon a positive response to diagnostic controlled, comparative local anesthetic lumbar facet joint blocks. Outcome measures included the numeric rating scale (NRS), Oswestry Disability Index (ODI), opioid intake, and work status, at baseline, 3, 6, 12, 18, and 24 months. Results: Significant improvement with significant pain relief of ≥ 50% and functional improvement of ≥ 40% were observed in 85% in Group 1, and 90% in Group II, at 2-year follow-up. The patients in the study experienced significant pain relief for 82 to 84 weeks of 104 weeks, requiring approximately 5 to 6 treatments with an average relief of 19 weeks per episode of treatment. Conclusions: Therapeutic lumbar facet joint nerve blocks, with or without steroids, may provide a management option for chronic function-limiting low back pain of facet joint origin. Multiple structures in the lumbar spine including discs, facet joints, and sacroiliac joints have been considered the major sources of pain in the low back and/or lower extremities. Lumbar facet joints have been implicated as the source of chronic pain in 21% to 41% (with an overall prevalence of 31%) in a heterogenous population with chronic low back pain9-18 utilizing controlled comparative local anesthetic blocks with 80% pain relief and the ability to perform previously painful movements as the criterion standard. Further, based on the responses to controlled diagnostic blocks, false-positive rates of 17% to 19% have been established with an overall false-positive rate of 30%.9-14,16-18 Datta et al9 established Level I or II-1 evidence for the diagnostic accuracy of controlled facet joint nerve blocks based on the United States Preventive Services Task Force (USPSTF) criteria.19 In addition, Rubinstein and van Tulder20 concluded that there is strong evidence for the diagnostic accuracy of lumbar facet joint blocks in evaluating low back pain. Significant controversy surrounds the appropriate management of lumbar facet joint pain, with multiple therapeutic techniques established in managing chronic low back pain.9,10,21-23 The systematic review by Datta et al9 provided Level III (limited) evidence for lumbar intraarticular injections,24,25 Level II-1 evidence for lumbar facet joint nerve blocks,26-28 and Level II-2 evidence for lumbar radiofrequency neurotomy.29-31 The exact mechanism of the therapeutic effect of lumbar facet joint nerve blocks is not known, whereas radiofrequency neurotomy causes denaturing of the nerves. Consequently, with radiofrequency the pain returns when the axons regenerate requiring repetition of the radiofrequency procedure. Similarly, lumbar facet joint nerve blocks may be repeated to reinstate pain relief without any deleterious effects. The basis for intraarticular injections has been the inflammation of the joint. The study was conducted at an interventional pain management practice, a specialty referral center, in a private practice setting in the United States. The study was performed based on Consolidated Standards of Reporting Trials (CONSORT) guidelines.33,34 The study protocol was approved by the Institutional Review Board (IRB) and the study has been registered with the clinical trial registry as NCT00355914. One hundred twenty patients were assigned to one of the 2 groups consisting of either a non-steroid group (Group I) or a steroid group (Group II). Both groups were also divided into 2 categories each with the addition of Sarapin. 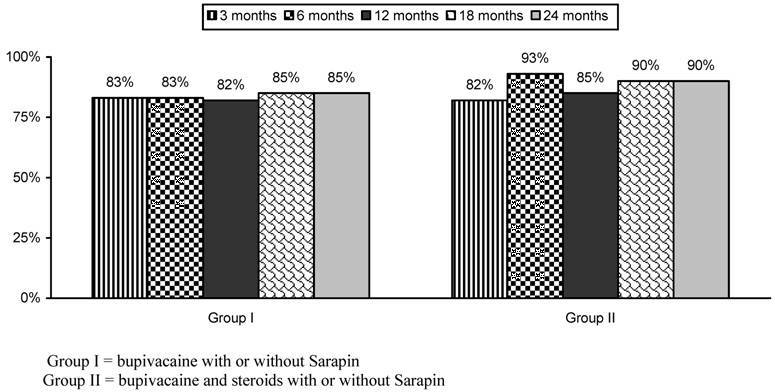 Both groups received bupivacaine with or without steroid, however, category B patients also received Sarapin in both groups. All mixtures consisted of clear solutions. Bupivacaine and Sarapin were mixed in equal volumes, and 0.15 mg of non-particulate betamethasone was added per mL of solution. Inclusion criteria consisted of those patients with a history of chronic function-limiting low back pain of at least 6 months duration, 18 years of age, who were able to provide voluntary informed consent, willing to participate in the study as well as the follow-up, with positive results to controlled diagnostic lumbar facet joint nerve blocks with at least 80% concordant pain relief and the ability to perform previously painful movements. For diagnostic lumbar facet joint interventions the exclusion criteria included radicular pain, surgical interventions of the lumbar spine within the last 3 months, uncontrolled major depression or psychiatric disorders, heavy opioid usage (morphine equivalent of 300 mg), acute or uncontrolled medical illness, chronic severe conditions that could interfere with the interpretations of the outcome assessments, women who were pregnant or lactating, patients unable to be positioned in the prone position, and patients with a history of adverse reactions to local anesthetic, Sarapin, or steroids. All of the patients were provided with the informed consent and protocol approved by the IRB, which described the details of the trial including side effects and the mechanisms of withdrawal from the study. All patients included in the study underwent controlled comparative local anesthetic blocks with 0.5 mL of 1% preservative-free lidocaine, followed by 0.5 mL of 0.25% bupivacaine on a separate occasion, usually 3 to 4 weeks after the first injection, if the results of the lidocaine block were positive. All of the procedures were performed in a sterile operating room, with intermittent fluoroscopic visualization, with intravenous access, and light sedation with midazolam being offered to all patients. A response was considered positive if there was 80% pain relief of at least 2 hours for lidocaine and 3 hours for bupivacaine and greater than the duration of relief with lidocaine, and the ability to perform multiple maneuvers which were painful prior to the diagnostic facet joint blocks. All other types of responses were considered negative; however, the diagnostic phase was not part of the study. In the therapeutic phase, patients were treated with lumbar facet joint nerve blocks under fluoroscopy in a sterile operating room with the injection of a 0.5 to 1.5 mL mixture at each level as assigned by grouping. Patients were followed at 3-month intervals unless otherwise indicated and lumbar facet joint nerve blocks were repeated based on the response to the prior interventions with improvement in physical and functional status. Lumbar facet joint nerve blocks were repeated only when the reported pain levels deteriorated to below 50%, with initial report of significant pain relief of 50% or more after the previous block. The non-responsive patients receiving other types of treatments after stopping therapeutic lumbar facet joint nerve blocks were considered to be withdrawn from the study, and no subsequent data were collected. All patients were provided with the same co-interventions as needed with opioid and non-opioid analgesics, adjuvant analgesics, and previously directed exercise programs prior to enrollment in the study. The adjustments in medical therapy were carried out based on the response to injection therapy and physical and functional needs. However, no specific co-interventions such as physical therapy or occupational therapy were provided. 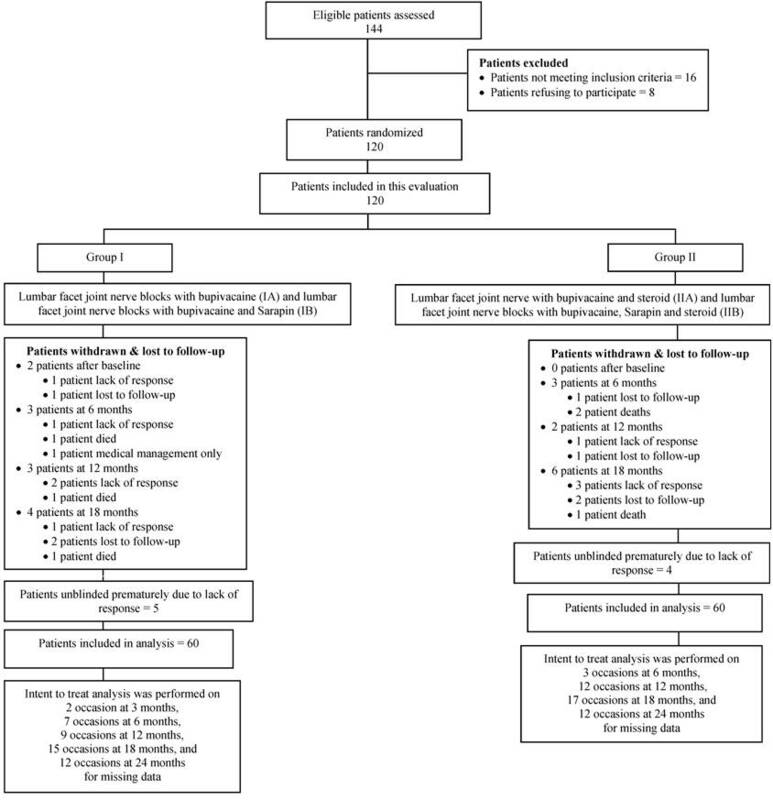 The objective of this randomized, double-blind, controlled trial is to determine the clinical effectiveness of therapeutic lumbar facet joint nerve blocks with local anesthetic with or without steroids in managing chronic low back pain of facet joint origin. Outcome measures included the numeric rating scale (NRS), Oswestry Disability Index 2.0 (ODI), employment status, and opioid intake, with assessment at 3, 6, 12, 18, and 24 months post-treatment. Significant pain relief was described as a 50% or more reduction in the NRS score, and significant improvement in function was described as at least a 40% reduction in ODI. Patients unemployed or employed on a part-time basis with limited or no employment due to pain were classified as employable. Patients who chose not to work, were retired, or were homemakers (not working, but not due to pain) were not considered in the employment pool. Sixty patients were randomly assigned into each group from a total of 120 patients. Among each group, 30 patients were assigned to each category for Sarapin. Randomization was carried out in blocks of 20 patients by a computer-generated random allocations sequence. Patients were randomized and the drugs were prepared appropriately by the operating room nurse assisting with the procedure. All drug mixtures appeared to be identical. After the patients had met the inclusion criteria one of the 3 nurses assigned as coordinators of the study enrolled the participants and assigned participants to their respective groups. All the patients were invited to enroll in the study if they met inclusion criteria. The random allocation was not revealed to personnel in the recovery room or to the physician performing the procedure. Study patients were mixed with other patients with no specific indication that patients were participating in the study. Patients were unblinded if they requested to be unblinded or after completing 24 months of the study. Patients were provided with an opportunity to discontinue or withdraw from the study for lack of pain relief or for any other reason. All the patients with loss of follow-up were considered to be withdrawn. Chi-squared statistic, Fisher's exact test, paired t-test, and one-way analysis of variance were used to analyze the data. Chi-squared statistic was used to test the differences in proportions. Fisher's exact test was used wherever the expected value was less than 5; a paired t-test was used to compare the pre- and post-treatment results of average pain scores and the ODI measurements at baseline versus 3, 6, 12, 18, and 24 months. The t-test was performed for comparison of mean scores between groups. One-way analysis of variance was used for comparison of means among groups. Initially, categories with or without Sarapin in each group were analyzed by comparing them to each other. Subsequently, local anesthetic and steroid group were compared if there were no differences. An intent-to-treat-analysis was performed on all patients utilizing the last follow-up data. Initial data were utilized in the patients who dropped out of the study without further follow-up after the first treatment. Sensitivity analysis was performed utilizing best case, worst case, and last follow-up scores scenarios. Figure 1 illustrates the participant flow. The recruitment period lasted from November 2003 to July 2006. Demographic characteristics are illustrated in Table 1. There were significant differences between Group I and II with respect to height with Group II patients taller than Group I patients. This is not expected to change the outcomes. The number of joints involved was as follows: 2 joints were involved in 70% of the patients and 3 joints were involved in 30% of the patients. Bilateral involvement was seen in 79% of the patients. Data were analyzed for both categories in each group to evaluate the influence of Sarapin. There were no significant differences. Thus, descriptions are provided for the 2 groups with local anesthetic with or without steroid. Figure 1 illustrates details of patient follow-up and intent-to-treat analysis. Schematic presentation of patient flow at 2-years follow-up. A sensitivity analysis with changes in numeric pain scale was performed utilizing last follow-up score, best case scenario, and worst case scenario as shown in Table 2. There were no significant differences; hence, intention-to-treat analysis with last follow-up visit was utilized. Numeric pain scale scores are illustrated in Table 3. There were significant changes in pain scores from baseline, at 3, 6, 12, 18, and 24 months in all the groups, with no differences among Groups I and II. At 2 years, the proportion of patients with significant pain relief was 85% and 90%, in Groups I and II respectively (Fig. 2). Table 4 illustrates the therapeutic procedural characteristics with average weeks of pain relief per procedure over a period of 2 years. Table 5 and Figure 3 illustrate functional assessment characteristics evaluated by ODI. Table 6 illustrates opioid intake with no significant change. Table 7 illustrates the summary of employment characteristics in both groups. Among the patients eligible for employment, total employed changed from 10 at baseline to 16 at the end of 24 months in Group I, and it changed from 17 to 22 in Group II. There were no adverse events reported during this study. Sensitivity analysis of numeric pain rating scores (NRS). Proportion of patients with significant relief of ≥ 50%. Proportion of patients with significant functional status improvement (≥ 40%) as measured by Oswestry Disability Index (ODI). Therapeutic procedural characteristics over a period of 2 years with average relief per procedure in weeks. Functional assessment evaluated by Oswestry Disability Index scores (Mean ± SD). Daily opioid intake in mg of morphine equivalents. This randomized, double-blind, controlled trial comprised 120 patients with chronic function-limiting low back pain of facet joint origin who were treated with therapeutic lumbar facet joint nerve blocks. Significant pain relief was shown in 85% of Group I and 90% of Group II at the end of the 2 year study period. No significant differences were noted whether patients received treatment with local anesthetic only or local anesthetic and steroids. In addition, functional assessment as measured by ODI also showed significant improvement, with at least a 40% reduction in disability scores in 87% of patients in Group I and 88% of patients in Group II. Over the 2 year period, the average pain relief per procedure was 19 weeks; the average number of procedures was 5-6; total relief lasted 82 to 84 weeks. The results of employment status and opioid reduction were not significant. Pain relief and improvement in functional status were significant. Strict criteria were used for diagnosing facet joint pain; controlled, comparative local anesthetic blocks were used, thus avoiding criticism of including patients without facet joint pain in the study. Overall the results of the current study are similar to previous studies.26-28 There are no other studies available, either observational or randomized, evaluating the therapeutic role of lumbar facet joint nerve blocks with a long-term follow-up of at least 2 years. In this randomized, double-blind, controlled trial we found that the 2 drugs used in combination with local anesthetic, namely Sarapin and steroid, did not differ significantly in their response. The small differences between the 2 treatments are unlikely to be of clinical importance even in larger studies. The difference between 2 placebo injections of a sodium chloride solution and dextrose has been shown.49 The experimental and clinical findings from investigation of the electrophysiological effects of 0.9% sodium chloride and dextrose 5% in water solution have added new knowledge and controversy to multiple aspects of neural stimulation used in regional anesthesia. The potential inaccuracy created by 0.9% sodium chloride solution versus 5% dextrose has been described.49,55 Further, the evidence also has shown differing effects of sodium chloride solution when injected into the disc, the facet joint, or paraspinal muscles.53,54 Indahl et al53,54 studied the electromyographic response of the porcine multifidus musculature after nerve stimulation,54 and interaction among the porcine lumbar intervertebral disc, zygapophysial joints, and paraspinal muscles.53 They showed that stimulation of the disc and the facet joint capsule produced contractions in the multifidus fascicles.54 They also demonstrated that the introduction of lidocaine into the facet joint resulted in a significantly reduced electromyographic response, with the most drastic reduction seen when stimulating the facet joint capsule. Surprisingly, they53 also showed that the introduction of physiologic saline into the zygapophysial joint reduced the stimulation pathway from the intervertebral disc to the paraspinal musculature. Consequently, they hypothesized that the paraspinal muscle activation caused by nerve stimulation in the annulus fibrosus of a lumbar intervertebral disc could be altered by saline injection into the zygapophysial joint. The evidence cited above leads to the conclusion that the effect of local anesthetic on lumbar facet joint nerve blocks cannot be attributed to placebo effect, even though it has been misinterpreted by some.56 Recent articles concerning vertebroplasty57,58 have generated further interest in placebo control trials. However, in neither group, even though they were randomized, were the results long lasting; this is in addition to other criticisms of the design, etc.59-63 Consequently, placebo effects are not expected to be seen in a high proportion of patients nor are they expected to be long lasting with repeat interventions over a period of 2 years. However, the limitations of the lack of placebo must not be underestimated. If feasible, a placebo-controlled study with appropriate design that includes not injecting the placebo solution over the facet joint nerves, and the subsequent results, would be highly valid and provide conclusive knowledge on the issue of placebo controlled blocks. A review of the literature shows that the present study is the largest to evaluate the effectiveness of lumbar facet joint nerve blocks in a randomized controlled trial (though not placebo controlled) with a 2-year follow-up. The argument that the same drugs are used for diagnostic and therapeutic blocks has no relevance. This is similar to transforaminal epidural injections wherein the same local anesthetic is utilized for both diagnosis and therapy. In summary, the results present a real-world example describing patients in a private interventional pain management practice setting, with results generalizable to similar settings. However, the results are not applicable to the general population unless the same methodology is used for both diagnosis and therapy. The generalizability of the findings of this study might only be feasible if studies are published using large populations in multiple settings. The evidence in this report demonstrates lumbar facet joint pain diagnosed by controlled, comparative local anesthetic blocks may be treated with lumbar facet joint nerve blocks either with or without steroid. The authors wish to thank Sekar Edem for his assistance in the literature search; and Tonie M. Hatton and Diane E. Neihoff, transcriptionists, for their assistance in the preparation of this manuscript.